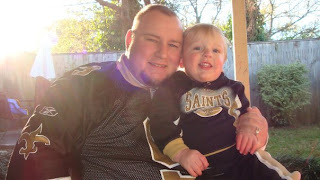 Holy crap, the Saints are going to the Superbowl! I can't believe it. Seriously, this is amazing. I actually watched the playoff game. I know, it's so unlike me. I don't understand football at all, I just don't get it. I decided to watch this game since it was an important game and it was pretty fun! My family was over and we were all anxiously awaiting for a win. When we headed into overtime we all got pretty nervous, I mean it was such a nail biter! When we kicked and won everyone in the house was yelling and screaming. It was so exciting! My husband cried. Yes cried like a big fat baby. He didn't cry at our wedding...or when I gave birth to his son, but he cried over a playoff game. Pretty nice huh? Hopefully if/when we have another baby he will at least fake cry for it. Yes, I'm a bit bitter. Haha! But anywho, back to the game! Once the Saints won Clint and my brother in law Brian were jumping up and down screaming and picking each other up (more like Clint picking Brian up!). It was really cute. People were outside popping fireworks it was very surreal and incredible. It's so much fun for everyone to be so positive and excited! This past week the city is electric. Everyone is wearing black and gold and anything SAINTS is flying off the shelf. Schools have even canceled class for next Monday. It's nuts here! Hopefully the Saints win, but just coming this far has been amazing. Bless you boys! Who dat!